ALLURE LOCKING is the perfect solution if you are looking for 100% water proof and termite free flooring. 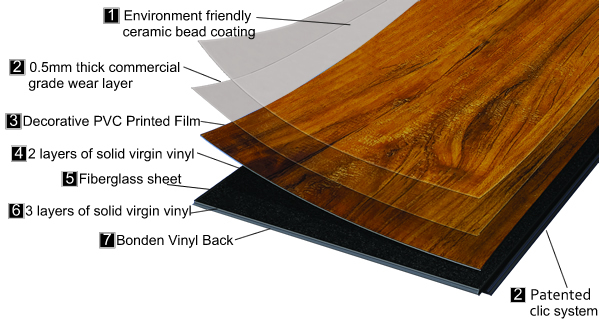 This is the latest in a long line of innovative flooring products from VERTEX that has been equipped with patented CLICK system for simple and glue-less installation. This unique feature of interlocking panels, has a perfect waterproof connection between the planks that virtually leaves no room for the water to seep through, and it can cope with the most extreme humidity. ALLURE LOCKING is made from top quality virgin resins and, because it is not constructed from wood, the floor does not swell or deform under the influence of water. Also, termites will not attack the resin material. Due to its waterproof properties, this revolutionary product makes a perfect choice for many applications and it works in most non-excessively wet areas such as restaurants, kitchens, laundries etc. Allure Locking uses CERAMIC BEAD TECHNOLOGY in the coatings for additional wear resistance and durability. - Do-It-Yourself (DIY) concept flooring. ALLURE LOCKING is a floating floor therefore it does not need to be attached to the subfloor. Just simply install it straight over most hard surfaces including ceramic tiles, timber, concrete, and even your existing vinyl floor! ALLURE LOCKING comes with a high commercial grade wear layer that makes it so durable that the products can be used in both residential and commercial applications. It also features deep embossing resembling the richness and deep texture of hardwood. The hard wearing embossed surface, treated with ceramic bead technology coating, is a lot more scratch and abrasion resistant than timber flooring. When it comes to peace of mind, you can’t go wrong with Allure Locking.